Fresh academic research into the 38 stones and fragments strongly suggests that St Vigeans was once home to an important royal monastry. It may also have been a significant pilgrimage centre, perhaps due to the presence of relics of the Irish St Fechin, from whom the village took its name. Back in the 9th century Arbroath was a small port serving the needs of the more important settlement at St Vigeans. The large stone crosses would originally have been set up as monuments, boundary markers and gravestones on the church hill at St Vigeans. 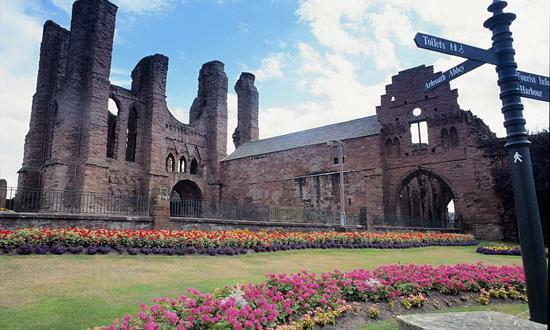 ​ Arbroath Abbey on 01241 878756. Sunday, April 14th, 9.30 a.m - 5 p.m.
Sunday, May 19th, 9.30 a.m. - 5 p.m.
Sunday, June 9th, 9.30 a.m. - 5 p.m.
Sunday, July 7th, 9.30 a.m. - 5 p.m.
Sunday, August 25th, 9.30 a.m. - 5 p.m.
Sunday, September 22nd, 9.30 a.m. - 5 p.m.
St Vigeans Museum is located near to the church. The museum is served by staff based at Arbroath Abbey and due to staff shortages, the museum isn't always open. However, visitors can telephone (01241 878756) or call at Arbroath Abbey to arrange access to the museum and staff will do their best to oblige. During the summer, however, the museum will be open on Saturdays 9.30 to 5 p.m. once a month. Please refer to the "Notes" (in red type) for dates. Also, groupl visits can be arranged by telephoning 01241 878756. A computer database is available to view in the museum and a CD-ROM of the database is available for purchase. For further information visit the website of Historic Scotland.